If you’re going to buy restaurant gift cards to give to friends, family members, and associates this Christmas, you might want to buy from restaurants that will give you a nice bonus in return! Last Christmas, I noticed that some retailers and restaurants started giving bonuses to people who buy their gift cards. Some even had banners hanging outside their restaurant, advertising the fact that they were giving out bonuses to gift card buyers. I bought restaurant gift cards from a couple of national brands like Ruby Tuesday and Chile’s, and a local brand in our area, Brann’s Sizzling Steaks & Sports Grille. 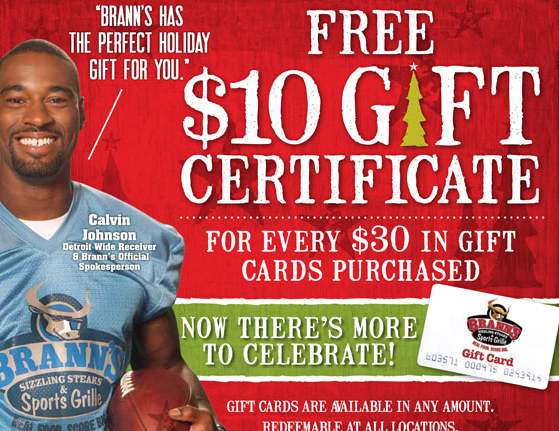 Brann’s gave me a $10 gift certificate for every $30 I spent on gift certificates. I think the other brands gave me a $5.00 certificate for every $25.00 I spent on their gift cards, or maybe it was $10 for every $50 that I spent. It was a nice treat to be able to buy restaurant gift cards to give away for the holidays, but to also receive a nice bonus in return. Incidentally, I used those bonuses on a couple of dates with my wife. All restaurant gift card bonus certificates have certain terms and conditions, so be sure to check yours to learn all the details of how you can redeem them. Effective dates & Expiration dates – The bonus certificates I received last Christmas were valid after January 1 and expired within a couple of months. Be sure you know when yours are valid, and mark your calendar to use them before they expire. Been there. Done that! Exclusions & Limitations – I don’t remember any exclusions or limitations on my bonus certificates last year. But some restaurants may limit what you can buy, or may limit the day you can use them. For example, some may be valid only Sunday through Thursday, for example. We’ve seen record numbers of gift card purchases nationwide over the last few years, and there’s more competition than ever from restaurants who want us to buy their gift cards. So keep on the lookout for these bonus deals if you’re buying restaurant gift cards for people on your list this Christmas. What’s the best restaurant gift card bonus that you’ve received? Will the Supreme Court Take Away Your Right to Sell Your Stuff? 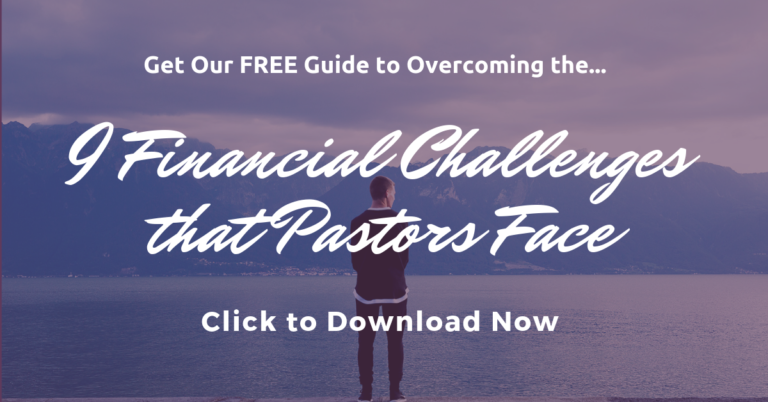 Should Pastors Talk About Politics?